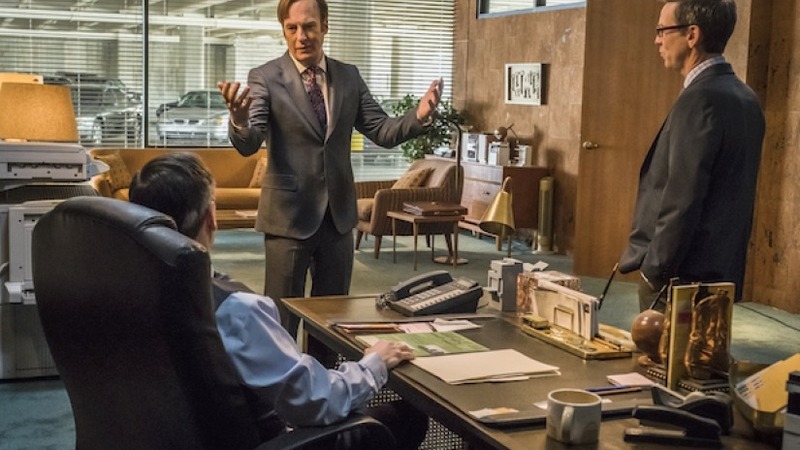 Better Call Saul keeps the train moving in another table-setting episode. I guess it’s hard to call them table-setters when they’re more puzzle pieces. Pieces coming together to answer one critical question. So who is Jimmy McGill? After last week was spent, fittingly, cast in the glow of Charles McGill, the Great Man, we closed on that question — the one question this show is really about. We know who Saul Goodman is. For better or for worse, we understood him. We understood what motivated him. We definitely understand poor Gene Tacavic. We thought we understood Jimmy, and then he laughed mirthlessly when his own brother died. We start this case file tonight with Jimmy getting an interview for a job he seems particularly suited for: a salesman for a company that sells copiers. He knows copiers, and as he so eloquently tells the man he interviews with, practicing the law is it’s own kind of salesmanship, one he is very good at. Not having experience, he is summarily brushed off with the “we’re going to put our heads together and get back to you” excuse everyone has heard more than once. Undeterred, he barges back into Mr. Neff’s office and essentially hard sells them. To his surprise, they offer him the job. To our surprise, Jimmy flatly refuses. He wouldn’t want to work with someone who would just give a job to the first ruffian off the street who could sweet talk them into a job. It’s a shame, not only because I think Jimmy would be perfectly suited to the position (almost suspiciously so, like he’s a character in some sort of TV show and this job was written for him), but because if he had taken it, I’d bet he would enjoy it just enough, some legal conning, that he might keep it and leave the law in the past. No more Slippin Jimmy. No more Saul Goodman. No more Better Call Saul. Well, at least no more titular character. Elsewhere, the Ballad of Mike Ehrmantraut keeps on a-tickin, as he essentially gets called into the principal’s office to answer for his “security consulting” last week. Only this time, the principal is a short raven-haired woman who loves Stevia almost as much as she loves committing international securities fraud. I speak, of course, of Lydia Rodarte-Quayle, who tries very unsuccessfully to stop Mike from continuing his consulting services across Madrigal’s other plants to, as I correctly assumed, put a name to the face and shore up his very fake consulting job by doing some very real consulting work. A key distinction between Mike and Jimmy is that while both will lie and steal and con their way through life, only Mike will actually do his due diligence and make sure things are done right. Lydia, upset (and rightfully nervous at this strange old man who doesn’t care about her power suit and her weirdly powerful-looking legs), calls Gus, who brushes her off and tells her to give Mike a badge, which I assume she does. Make the security consulting as official as possible, and nobody snooping into Madrigal will think twice about this ex-cop with a great alibi. At least, not until some crazed former chemistry teacher starts blowing everything up and getting all the ex-cops he knows killed. Finally, the biggest chunk of tonight’s episode comes from the unofficial third and fourth protagonists of this show: Kim and Nacho. Starting with the latter, we first find him visiting Hector Salamanca in the hospital, alongside Arturo and the Cousins, standing vigil like two insanely murderous gargoyles (so just normal gargoyles, then). In an especially awkward bit of fate, Nacho ends up having to give a rousing pep talk to the man he hates most in the world, Don Hector, after the Salamanca’s new doctor, a suspiciously-placed Johns Hopkins transplant who can speak Spanish and English fluently (and was no doubt hired by Gus Fring), encourages them to talk to Hector as often as possible to help his brain reconstruct itself. After that, Nacho and Arturo show back up at that warehouse for another pickup and have another standoff with Tyrus and Victor over how many packages the Salamancas get compared to everyone else. Nacho, employing his newfound confidence after having seemingly escaped the poisoning of Don Hector unharmed, pulls a gun. He doesn’t tremble. He doesn’t hesitate. In Nacho’s mind, he’s become untouchable, so of course he gets his way. That is, until he goes to leave and the Chicken Man himself emerges from the shadows with a bag and some zipties, hogtying poor Arturo and suffocating him to death. As Arturo gasps for air and slowly gives out, Gus looms over Nacho, telling him that what he did did not go unnoticed and that he “belongs to me now.” The most absorbing decision this show made was to center this plotline on Nacho, since we know more or less what happens to all the other major Cartel players. We know Gus, Juan Bolsa, Hector, the Cousins, and even Victor and Tyrus survive the events of this show. Hell, we even know that Hector, Gus and Tyrus all die at the same time. What we don’t know, aside from a potential throwaway line in Season 2, is what happens to Nacho. Of all the characters here, save Kim, Nacho is the great unknown. Speaking of Kim, we pick up with her representing Jimmy at a meeting at HHM to sort through the McGill estate, cordially rebuffing Rebecca before completely ripping into Howard for having the temerity to suggest Jimmy would want to go sorting through the ashes of his brother’s house for some trinkets. If the audience is to understand the enigma that is Jimmy McGill, then Kim is the poor, doomed lens through which we do so. She knows by now that putting Jimmy on the committee for a scholarship in Chuck’s name, a scholarship she again very correctly assumes Chuck would never in a million years give to someone like Jimmy, would be condemning him to an eternity of pain. Jimmy wants to be done with the whole McGill affair. Perhaps it’s time for him to become a new man. To enter the final stage of this weird chryrsalis and become the big beautiful butterfly we’ve known since 2009. After everything we’ve seen from him in Saul, it’s almost a shame that we know where Jimmy is headed. It’s a little disappointing, really. 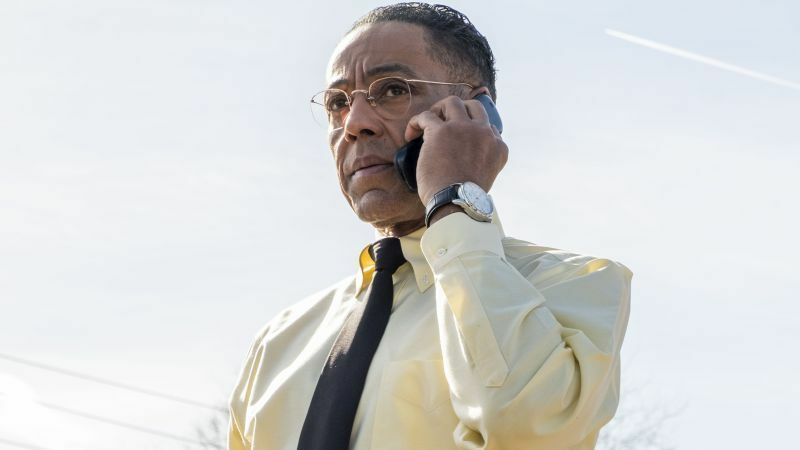 The Saul Goodman we knew from Breaking Bad never stood a chance against the likes of Gus Fring. Jimmy McGill? Well, I’m not even sure we know who he is. To wit, he ends the episode by looking up the value of the Hummel figures he saw at Neff Copiers online, then calling Mike about “a big job,” presumably Mike breaking into the offices and stealing them. So who is Jimmy McGill? To his clients, he was a great lawyer. To his brother, he was a great criminal. Two parts of himself, equally true, that were always at odds with one another. So it’s about time he combines those two facets and becomes a criminal lawyer again. For the first time. Calling back to one of Jimmy’s first clients with the little Hummel figurines is a great way to visualize the metaphor I just used. What better way for Jimmy McGill to finally die than by stealing a direct visual representation of his old client base? Not much else to say about the pre-credits scene, where Gus patiently awaits updates on Hector’s condition other than what is said there on the surface. Gus doesn’t want Hector to die well-taken care of in a hospital room before he answers for the crimes he committed against Gus, so he won’t (that this show not only expects but demands viewers to remember the specifics of a feud first introduced nearly seven years ago on a another show speaks to how it handles itself differently from the rest of television). We still don’t know the full extent of Gus’s power, but if he can call in a doctor from Johns Hopkins in what feels like a couple days, then it’s pretty mighty indeed. The scene where Kim tears into Howard Hamlin with a righteous fury is amazingly well acted by Rhea Seehorn. 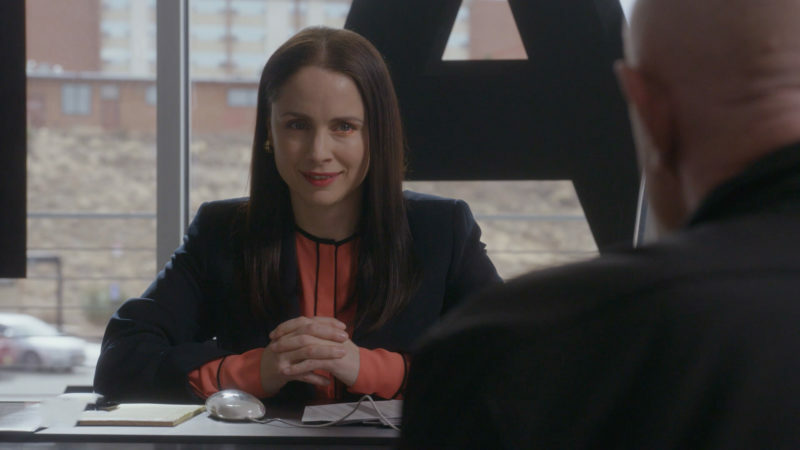 From the start of this entire show, she’s continually kept pace with anything Bob Odenkirk, Michael McKean or Jonathan Banks have thrown out there. Remarkable actress. Special shout out to Vincent Fuentes, the actor who played Arturo, who gave a nice greasy charm to a pretty thankless generic mook role. The last thing I expected this show to give me was an unofficial It’s Always Sunny in Philadelphia minor character reunion, as the actor who plays Mr. Neff, Andrew Friedman, has a recurring role as Charlie’s weird Uncle Jack, while Michael Naughton, playing the man who interviews Jimmy, had a small role on that same show as a man who interviewed Charlie and Mac for a job. I can’t imagine that is a coincidence. Both actors have a lot of fun playing friendly, nebbishy corporate types, precisely the kind of people Jimmy feels the worst about conning. They probably remind him of his father, who trusted every sap with a good story who ever came into his store. This episode was written by Thomas Schnauz and directed by Michelle McLaren, which is as close to the A-team you can get on this show without Vince Gilligan himself strapping in. One of the biggest reasons I consider this the best show on television is the type of talent it can routinely throw behind the camera and in the writer’s room. It’s unrivaled.